After being bedridden with a serious concussion, Drew had plenty of time to build up a passion for greatness. When the doctors gave him the 'OK' he went to work. It all started when I was recovering from a serious concussion (total of six months of rehab/bed rest). While I was on bed rest, I was just lying there and a burning grew inside me. It was telling me I wanted more from life and wanted to be the best I could be. So, as soon as I was given the okay by the doctors to work out, I got a hold of my dad (who was an All-American athlete and gym rat in his day), grabbed a pair of dumbbells, and we went to work. It is amazing how much you really take for granted until it has been taken away from you. 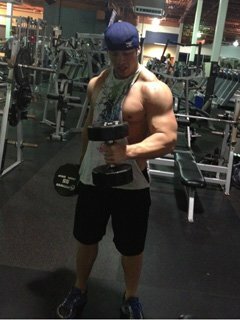 It all brings me to where I am today; full-time pre-med student/personal trainer/all-natural bodybuilder. My workout plan is very random. I never know what I am going to do in the gym that day, but I keep a basic format. I like to work the same body part twice a week with high sets and low reps. It's not a very common routine, but I found that this works the best for me. I break it down into three workout days and repeat. Then I take the seventh day off. For my first day, I normally like to work my push exercises (basically any exercise that involves pushing including bench press, military press, skull crushers, etc.). The second day I do pulls including curls, bend over rows, reverse curls, etc. And, for my third day, I leave that for all legs, abs and cardio (not my favorite day, but you need to do it!). I split my nutrition plans into three groups: "bulking", "shredding", and what I call "post-intra." Bulking: I do mostly a "clean bulk." I really do not like eating unhealthy foods, but I try to force myself during my bulking stage. I eat almost everything in sight so I can pack in the calories. However, my diet through my bulking revolves around red meats. Steak, ground beef, and anything else I can get my hands on. In addition, I stack some high carbs like yams or pasta with every meal. Shredding: I eat super clean during this time. Egg whites, fish, grilled chicken, and veggies only! Personally, I love being on this diet because you see almost instant results and your body feels amazing and clean. I have found that I can only stay on this diet for a certain amount of time before I start to lose gains instead of progressing them. Post-Intra: I designed this diet as almost a hybrid of my bulking and shredding routines. It consists of red meat, fish, and pasta mostly. I try to keep this routine very stable with a good balance of medium/high calories. But, not an indulging amount in order to keep the "clean" and healthy feeling. This routine also works great with me due to my extremely busy schedule during the school semester. A mixture of all three routines I have found very beneficial. There is a time for each of them; I just have to listen to my body and figure out which plan to execute at the right times. Diet is the most important thing in my opinion. All-time favorite supplements for gains would have to be Optimum Nutrition's Pro-Complex, BCAAs, and EFX Karbolyn. I have found this stack to be great for recovery and muscle energy. Your body has windows of recovery; I like to make sure I have protein loaded ready for when those windows open up. This keeps me in an anabolic state. During my bulking stage, I also find taking Gaspari Nutrition's SizeOn Maximum Performance works great! I see great recovery and bulking results due to the creatine and whey mix it contains. However, the creatine will add water weight and give me a bloated look so I only use it during my bulking time. It has to be the mindset I love most of all. Every day is like a battle challenging myself to higher heights and continually progressing. 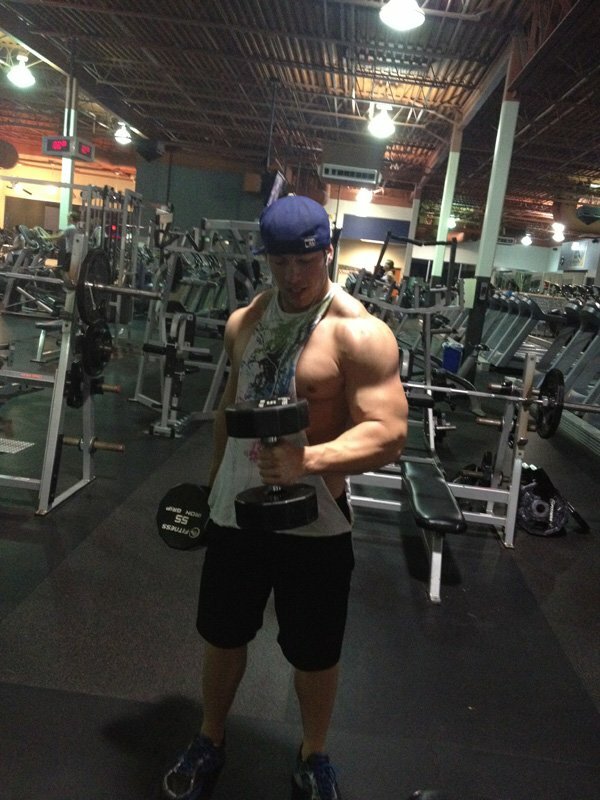 I have been able to use bodybuilding to help me work hard in things such as work and school. It has been an all-around gain from a physical to mental aspect. Also, nothing feels better after a long day of school then to just put on my headphones, hit the gym, and leave; knowing I have made myself better. Supporters: People such as my dad, my workout partners, fans, and mentors keep my head straight and pushing forward. Naysayers: These are people who tell me: "You can't do it." Instead of listening to them, I choose to turn it into a challenge. That challenge fuels a burning inside of me that tells me to keep striving for perfection. Making high goals for myself: High goals that seem unreachable keep me focused. It all had to start with my concussion I received from lacrosse my sophomore year of high school. Before then, I did not really care much about health and success and lived life with few goals. However, I always dreamed of big things, but never planned on executing them like I have now. I continue to make higher and higher goals for myself and challenge myself every day to progress. It seemed like it took total trauma and to have everything taken away from me, to finally wake up and start living. Never stop learning. You are never going to get to a point where you know it all. That is why supplements on the shelf change every few weeks; there is always something "new" and "better" out there. Always keep trying to find that something "new" and "better." I personally like a lot of different bodybuilders because I think everyone brings something different to the bodybuilding world. Mike O'Hearn, Ronnie Coleman, Kevin Levrone, Flex Wheeler, Kai Greene, and Phil Heath are just a few names of great bodybuilders who have all contributed something great to the fitness world. However, this is going to sound very cliché, but I am a total Arnold fan. Arnold "The Oak" Schwarzenegger is in my opinion, the king. He has the greatest physique of all time and I truly believe he is the inspiration for ALL bodybuilders. I love the stats updates! I love checking out everyone's different stats and progression. It is by far the coolest feature.